When trying to compare the speed of different boats objectively, I like to use PHRF ratings to give a good idea of the actual performance differences involved. PHRF ratings are used to handicap all sorts of different sailboats so they can race together on the same course. They give a number which equates to seconds per mile, that is applied to a boat’s finishing time to determine overall performance in the race. If a boat has a lower number, it “gives” seconds to a boat with a higher number. Thus, a boat with a rating of 200 is expected to finish a one mile course 50 seconds faster than a boat rated 250. The lower-rated boat has to “give” 50 seconds to the higher-rated, slower boat when computing corrected times at the finish. So, if the boat rating 200 finishes the course 51 seconds ahead of the boat rating 250, it has won the race, but if it finishes, say, 48 seconds ahead, then it has lost on “corrected time”. The ratings are frequently adjusted to keep different boats on par. Racers are a competitive bunch, and this is a widely accepted system used for many different types of sailboat races, so I think it is a pretty good way to compare the speeds of different boats. Just for comparison’s sake, let’s look at a Westsail 32, which rates 222, or 222 seconds per mile slower on average than a boat that rates 0. How do some other designs compare? The Crealock 34, which is a design that is held in quite high regard by many cruising sailors, rates 201. That’s only 21 seconds per mile faster, on average… How about a Contessa 32, another classic design that has a reputation for being weatherly and fast in a wide range of conditions? The Contessa 32 rates 180, or 42 seconds/mile faster than the Westsail 32. 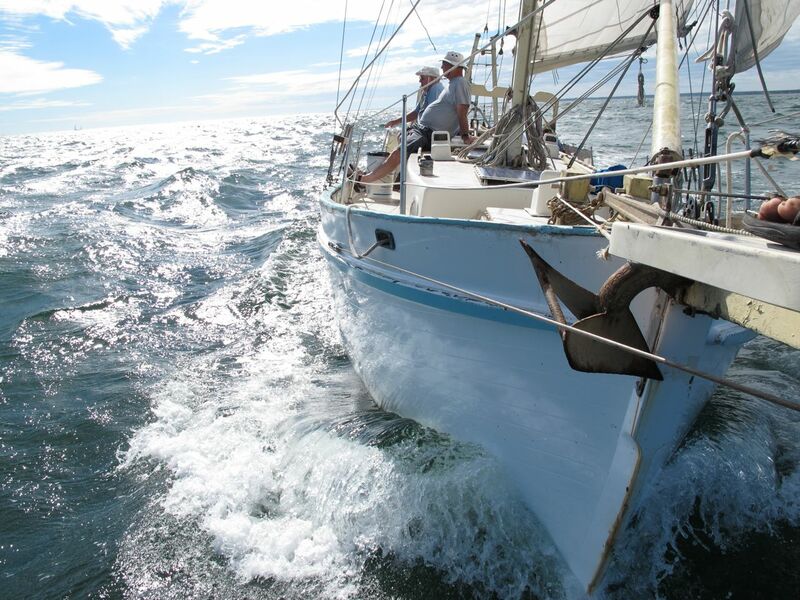 Over a 100 mile course, with both boats racing, the Contessa would be expected to finish 70 minutes faster. Over a 2,000 mile course–a huge distance: 23.3 hours. That’s a 1 day difference on a 2,000 mile crossing between a boat that has a reputation for being a slug and one that was designed as a racer/cruiser has a reputation for being quite fast in all sorts of conditions. The only PHRF rating I can find for the Dreadnought 32 is listed in San Francisco. There are not enough Dreadnought 32’s racing on the east coast to give the design a rating. The Dreadnought 32 PHRF rating is 222–same as the Westsail 32. The PHRF ratings provide the most accurate speed comparison when there is a mix of different points of sail. If the above example citing the Westsail 32 and Contessa 32 were sailed all upwind, I would expect the Contessa to easily out-sail the Westsail every time. However, if the passage were mostly reaching or running (fair winds), the differences will be smaller. Cruising sailors prefer to plan passages that take advantage of fair winds so the actual differences may be smaller than the ratings suggest when that is taken into account. In races, the finishing time differences normally stretch out to more than in the example above because of differences in decisions made by the crew. A poorly sailed Contessa 32 could easily finish a 2,000 mile course more than a day behind one that was sailed by a top crew. A similar time difference is possible due to poor sails. A difference in the duration of a passage is as likely to be caused by local weather, a meander in an ocean current, crew decisions, boat condition (how clean the bottom is, especially), sails, etc., as the actual speed potential of the boat being sailed. The PHRF list I use is available at: http://www.phrfne.org/page/handicapping/base_handicaps Not every boat in the world will be there, as there has to be enough of them being raced to get accurate rating data. Still, you can get a pretty good idea of the relative speeds of a lot of different boats in real-world conditions. The system is not perfect, and each boat design has conditions where it will often out-sail it’s rating, but this data has been gathered over many years of racing in varied conditions and is frequently updated when it becomes apparent that a particular boat design (or even a particular boat) has an unfair advantage due to rating. I hope the above gives enough information to at least keep the actual speed differences in perspective. It is impossible to consider take every factor into account when trying to compare boats, but some details will make a big difference. If you’re sailing in small, very protected waters in mostly light winds, the differences between a very heavy boat and a lighter one will be exaggerated, for instance. In real life, I have found that my Dreadnought 32 is surprisingly easy to drive on most points of sail at speeds that keep me happy (4-6.5 knots) with very little strain on the rigging. My running average speed over the last 2,000 miles is about 4 knots (per GPS log), but I have sailed the boat overly conservatively due to suspect rigging (which I am in the process of changing). That average includes a mix of offshore and ICW miles, many miles of me being lazy and not hauling out bigger sails on light-wind days, sailing reefed down when being conservative at night, and the like. It also includes motoring, where I run my boat slower than many people partly because I only have 15 hp in a 20,000 lb boat, and partly because I actually enjoy just tooling along slowly when under power… My average speed under power is a relaxed 4-4.5 knots, even though Idle Queen will power at 6.5 knots when needed.